Tisdale: NOAA Issues El Niño Watch for Second Half of 2012, Joe Romm Issues “Rapid Warming” Alert for 2013 | Watts Up With That? There is a 50% chance that El Niño conditions will develop during the second half of 2012. A 50% chance also means that El Niño Southern Oscillation (ENSO)-neutral conditions (not an El Niño and not a La Niña) are just as likely. Seems to me, an El Niño watch would have been more appropriate when the odds are weighted a little more toward El Niño. That may happen next month…and it may not. Within hours of NOAA issuing the watch, Joe Romm of Climate Progress published the blog post NOAA Says ’50% Chance’ El Niño Will Develop In Second Half Of 2012, Which NASA Says Would Lead To ‘Rapid Warming’. The majority of Romm’s post is a parroting of the contents of the January 12, 2012 GISS webpage Global Temperature in 2011, Trends, and Prospects. Let’s look at the source of the “rapid warming” in Joe Romm’s title. The cool La Niña phase of the cyclically variable Southern Oscillation of tropical temperatures has been dominant in the past three years, and the deepest solar minimum in the period of satellite data occurred over the past half dozen years. We conclude that the slowdown of warming is likely to prove illusory, with more rapid warming appearing over the next few years. 2011 was only the ninth warmest year in the GISS analysis of global temperature change, yet nine of the ten warmest years in the instrumental record (since 1880) have occurred in the 21st century. The past year has been cooled by a moderately strong La Niña. The 5-year (60-month) running mean global temperature hints at a slowdown in the global warming rate during the past few years. However, the cool La Niña phase of the cyclically variable Southern Oscillation of tropical temperatures has been dominant in the past three years, and the deepest solar minimum in the period of satellite data occurred over the past half dozen years. We conclude that the slowdown of warming is likely to prove illusory, with more rapid warming appearing over the next few years. The 5-year (60-month) running mean global temperature hints at a slowdown in the global warming rate during the past few years. However, the cool La Niña phase of the cyclically variable Southern Oscillation of tropical temperatures has been dominant in the past three years, and the deepest solar minimum in the period of satellite data occurred over the past half dozen years. GISS has stated that global surface temperatures have flattened, in part, because La Niña conditions dominated the last three years. Based on GISS Land-Ocean Temperature data, the 2009-2011 average NINO3.4 sea surface temperature anomalies (the ENSO index referred to by GISS in their report) was -0.19 deg C, and that confirms that La Niña has dominated the past 3 years. But the GISS statement also implies the opposite occurs when El Niño events dominate ENSO. It just so happens, I’ve been illustrating that fact for the past year and a half. It began with my post Multidecadal Changes In Sea Surface Temperature. The alternate title reads Do Multidecadal Changes In The Strength And Frequency Of El Niño and La Niña Events Cause Global Sea Surface Temperature Anomalies To Rise And Fall Over Multidecadal Periods? The WattsUpWithThat cross post is here. I also discuss this in the Introduction of my upcoming ebook The Ignored Driver of Global Climate: El Niño-Southern Oscillation. During a multidecadal period when El Niño events dominate (a period when El Niño events are stronger, when they occur more often and when they last longer than La Niña events), more heat than normal is released from the tropical Pacific and more warm water than normal is transported by ocean currents toward the poles—with that warm water releasing heat to the atmosphere along the way. As a result, global sea surface and land surface temperatures warm during multidecadal periods when El Niño events dominate. Similarly, global temperatures cool during multidecadal periods when La Niña events are stronger, last longer and occur more often than El Niño events. There are multidecadal periods, however, during the 20th Century when El Niño events are stronger and more frequent than La Niña events. We can illustrate this using the average NINO3.4 sea surface temperature anomalies for given periods. For our example, we’ll use the early and late 20th Century warming periods, and the mid-century “flat temperature” period. We’ll extend the late warming period to 2010 to bring it more up to date. 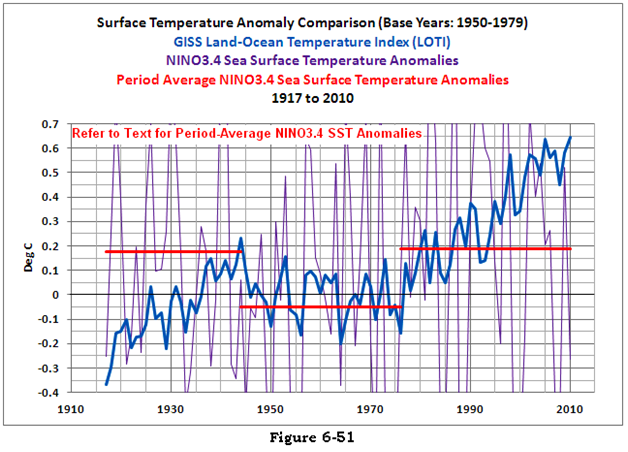 And we’ll compare annual NINO3.4 data to GISS Global Land-Ocean Temperature Index (LOTI) data. See Figure 6-50. The period-average NINO3.4 sea surface temperature anomalies during the early and late warming periods are quite similar. On the other hand, the period average NINO3.4 sea surface temperature anomalies during the mid-20th Century flat temperature period are slightly negative. 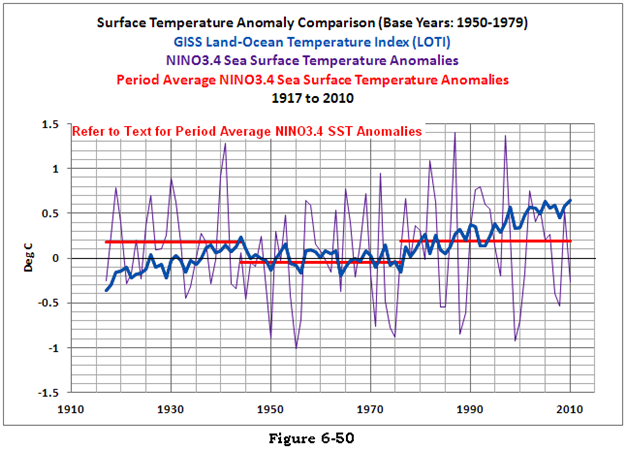 In Figure 6-51, the temperature scale of the graph has been reduced so that it better shows the global surface temperature and the period-average NINO3.4 sea surface temperatures. 4. more warm water than normal is being redistributed toward the poles. Suppose instead of the large periodic events, there were long-term low-temperature El Niño events taking place during those two periods; that is, one long El Niño during each warming period; we would expect surface temperatures to rise. And that is, in effect, what happened. 4. less warm water than normal is being redistributed toward the poles. So we would expect Global land plus sea surface temperatures to decline during that period. 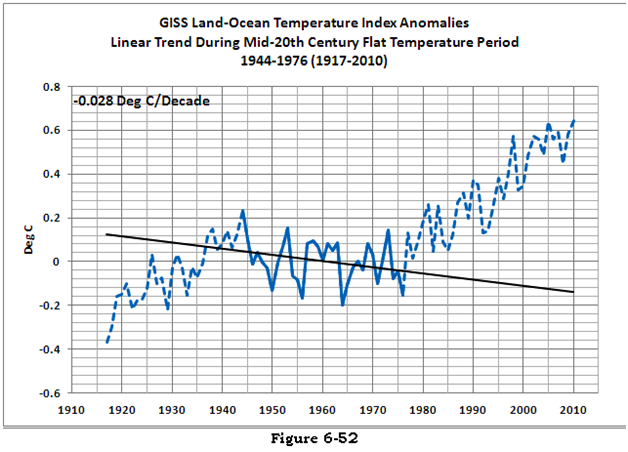 And using GISS Land-Ocean Temperature Index data, that’s exactly what happened during that period. Refer to Figure 6-52. Stay tuned. The heat is on. Apparently, Joe hasn’t realized the heat’s been on since 1976 when El Niño events started to dominate ENSO. Maybe, just maybe, we’ve recently entered into a new epoch when the frequency, magnitude and duration of La Niña events exceed those of El Niño. In other words, has El Niño turned over control of ENSO to his little sister La Niña? Only time will tell. INTERESTED IN LEARNING MORE ABOUT THE EL NIÑO-SOUTHERN OSCILLATION AND DON’T WANT TO WAIT FOR MY NEW BOOK? I hope to have my new ebook competed by the end of July. If that’s not soon enough for you and you’d like an idea of what’s discussed in parts of my upcoming book see If the IPCC was Selling Manmade Global Warming as a Product, Would the FTC Stop their deceptive Ads? Section 6, or about 25% of the book, is about the processes that are part of El Niño and La Niña events. Many of the discussions are rewordings (expansions and simplifications) of my posts here at Climate Observations, so you could save a few bucks and rummage through dozens of posts. But the book provides a single resource and reference for you and includes a very basic, well-illustrated introduction to El Niño, La Niña, and ENSO-neutral conditions written in simple terms. Included in that section are discussions of how La Niña events are not the opposite of El Niño events and how and why certain parts of the global oceans warm in response to certain El Niño AND to the La Niña events that follow them. The El Niño-Southern Oscillation is a marvelous process Mother Nature has devised to enhance or slow the distribution of heat from the tropics to the poles. It is process that naturally varies in intensity, and due to those variations, it is capable of warming or cooling global temperatures over multiyear and multidecadal periods. The individual chapter titles of Section 6 will give you an idea of the topics discussed. See pages 9 and 10 of the introduction, table of contents, and closing of my book in pdf form here. I like El Nino. La Nina makes droughts in Texas. El Nino doesn’t! Come on, El Nino!!! I’m rooting for El Nino this fall! More rain for Texas! Unfortunately for the many who are drought stricken, given the negative phase PDO, it really is a weak 50%. I’m going to do a rain dance! Sorry Texans, but if it’s gonna cool in the next few decades, there will be more La Ninas and I guess that means more drought in Texas. How was it in the 1950s/60s in Texas? I have been conducting my own experiments recently and have observed rapid cooling beginning at approximately 6:00 p.m. every evening and subsiding at nearly 5:00 a.m. every morning! I’m rooting for El Nino this fall! More heat for Alaska1 Anything to get rid of the giant pool of cold water surrounding the State! I want my Global Warming! Al Gore promised. Watch for rising temperatures this summer. We’re DOOOOOOMED!!! Sure the warmest years have occurred in the 21st century, all the old temperature data has been adjusted downwards to create the appearance of warming. Romm continues on his path to Thetic. Sad. Does NOAA issue La Nina watches? We had two in a row recently and I don’t recall being warned about it. I love Romm, he is the king of ‘breathless’ reporting. Is he now proposing that he agrees that it’s the SST’s, not CO2 that drives planetary temperatures? Eh? The El Nino lasted through the end of 2009 through most of 2010. I think a psychologist would say; the last thing a paranoid narcissist needs, is more attention. Poor things, jumping for joy at a 50% forecast. If Piers Corbyn is even half right about Earth’s circulation patterns tending towards Little Ice Age conditions, they’ll have tired themselves out for nothing. Happy is he who expecteth nothing. Been cool and rainy here in the (English) Midlands for a week now, just a couple of weeks short of the summer solstice. A case of “Ne’er cast a clout till t’ sun comes out” (with apologies to the original folk wisdom)! So – Joe Romm wants El Nino to warm the planet, so that he can claim that the warming is caused by CO2. I’m sure the prediction has nothing to do with November 6th. El Nino vs La Nina. Sorry, every time I look at one of these I have to look it up as to which is Pacific Ocean warming and Pacific ocean cooling. To me it means ‘the boy’ and ‘the girl’ – I live in the Baja. I guess the boy is hot and the girl is cold, I think the opposite would be appropriate. by loudly excoriating anybody reminding them of it. 2. The actual taxpaying, productive minority hit with a tax rate > 50%. 3. Majority of U.S. living off some kind of Govt check. 4. Majority of births illegitimate. 5. Majority of children brought up fatherless. 6. Majority of schoolchildren staying illiterate and innumerate. 7. Majority of cities looking just like Detroit. due to the past century of misrule by your kind. How can warming be caused by a non-taxable natural variation ? If the other natural non-taxable natural variation has been masking CO2 induced meltdown, why hasn’t la Nina been arrested for attempting to subvert the tax system ? I’ve been watching the little video of the Pacific temperatures on the ENSO page and it looked like an El Niño was building until recently. Now, it looks like cooler waters are moving in. If this continues I think we may be in for another La Niña. I think there are issues with both GISS and HADCRUT land/ocean datasets, because the late 20th century warming coincides with an increasing land ocean divergence. Basically the land is warming twice as fast as the oceans. Figure 10 at this link. I don’t see how this possible. The ocean surface should warm the same amount as the atmosphere in order to maintain the temperature difference necessary for it to lose the heat it gains from solar insolation and this should happen within a few days. A further issue is that the correlation between surface measurements and satellite measures are lowest (0.15) in the western Pacific. This is a puzzle, because it indicates ENSO doesn’t affect atmospheric temperatures the way everyone thinks it does. The El Nino if it does develop will be a weak El Nino. 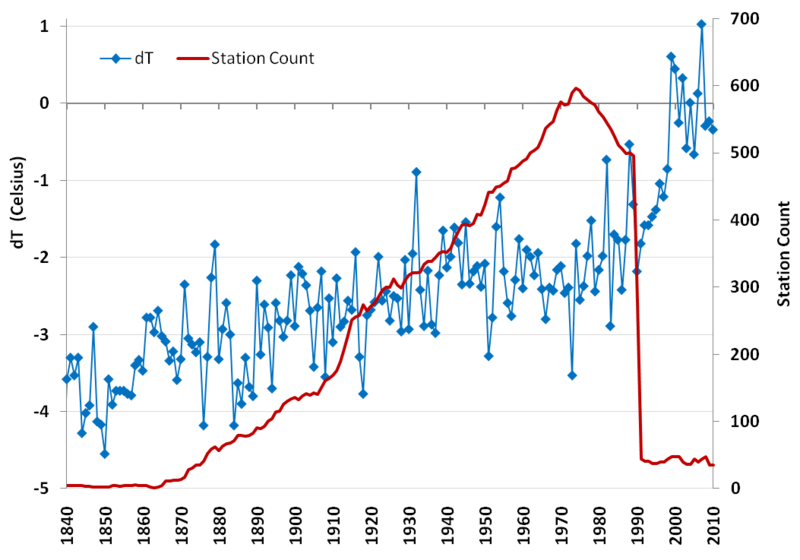 The longer term trend for the next several decades is toward conditions like we had in the period 1880-1910 if the solar predictions of 3 lower solar cycles prove to be correct. Philip, just in case you really don’t know the origins of La niña and el niño. The original name was el niño because it was a warm current which passed up the west coast of Sth America and arrived as christmas approached. It had the effect of killing the anchovy fishing season so was the only one of the 2 el/la that mattered. La Niña was considered normal because the fishing was good. Lots of food from the sth. Now watch ol’ Big Daddy Don Garlits here. As soon as that tree goes green we’re going to have rapid acceleration, up to 40m/s²! If that were to continue for 1000 years, he’d be going over 1.2 billion kilometers per second! That’s more than 4000 times the speed of light! Yes there are issues, they are ADJUSTED data sets. This study is of interest: Study finds stream temperatures don’t parallel warming climate trend OOPS looks like they missed a data set. Umm, about that ENSO meter. I get the data for that from http://www.cpc.ncep.noaa.gov/data/indices/wksst.for and for about the third time over the last year their (automatic, I assume) updater stopped updating. It starts up again after I notify them of the problem. After the last time, I found and considered shifting to one from Australia, I think I will this time. The data isn’t an exact match, but each is a weekly average and should be fine for our interests. At the moment I’m fighting with my wife’s MacBook that connect to but can’t print on our printers and converting routers because my venerable Linksys router’s radio transmitter fried when Apple support asked me to cycle power on it. Sigh. I’ll get to it ASAP. Excellent post, Mr. Tisdale. You explain it in a way that even a technological dunce like me can understand. You’re musings on whether ENSO may experience a reversal, with La Nina becoming the dominant one, are very thought-provoking. Joe Romm must have a sore cheek by now from the continued slap-downs you seem to be giving him. I thought it was all about CO2 – what with the Hispanic hat dances now controlling the Climate? GRANT SCIENCE IS BAD SCIENCE for it is like Government employee UNIONS – pay for services and votes. Same old Same old QUID PRO QUO – One government feeds the other our hard earned money – all agencies or Universities = all 100% government eating the tax payers food. A wise and frugal Government, which shall restrain men from injuring one another, which shall leave them otherwise free to regulate their own pursuits of industry and improvement, and shall not take from the mouth of labor the bread it has earned. This is the sum of good government, and this is necessary to close the circlue of our felicities. What? Hansen hasn’t predicted a “super” El Nino yet? The guy must be asleep at the switch. I always appreciate Bob’s observations, which are far more meticulous than I could ever manage. But I’ll add a few of my own, as a way of warning poor Romm, who’s sensationalism tends to make any observation at all next to impossible. First, there tends to be a “lag” before La Ninas and El Ninos show their effect. Due to this “lag,” we may be seeing a few more effects of the past La Nina before we see the El Nino effects kick in. and study the years 1975, 1976 and 1977 you can see a situation much like our current situation. A La Nina in the spring of 1976 gave way to a weak El Nino by the fall. The winter of 1975-1976 was mild, where I lived in Maine, but the winter of 1976-1977 froze the harbors right down to Virginia. It will not matter if “World Temperatures” rise 0.4 degrees. If the northeast USA is shuddering (like Europe did last winter,) and heating bills are through the roof, Romm had best bite his tongue. I sincerely hope Romm is correct. After the dismal winter we just endured here in the North of England, and the total lack of a Spring (even our resident Herring Gulls took notice – they only began mating in the last month or so) I was really looking forward to a decent Summer. We had roughly 10 days of hot sunshine on the cusp of May/June but since then it’s been nothing but clouds and rain, and the Met Office forecast for the rest of June is more of the same. In the late 1990s I was a true believer: I believed the hype that we were all going to fry due to Global Warming. Now I wish for the weather to be like it was back then. I turned the heat on in my house today. The NW area has had many broken recoreds lately, some going back to the late 1800’s. We had snow at pass levels this morning. Do these recent records mean we are cooling? No. But the fact that we have had several cold springs do. Yes we may have an El Nino in the near future. Cool decades are not devoid of El Nino’s. But based on the spin above, the next El Nino will bring out the warmers along with their prognostications of impending doom. They can be ignored. Or better yet, voted out of office. Nice post as usual, Bob. These are interesting times. I’m not sure what all the hub-bub is about. You’re data analysis has pointed to an El Nino for months. I for one would be shocked, otherwise. I still can’t believe the precision quoted in the temperature records. I used to know the record takers for many local government authorities in Queensland during the 80’s and 90’s. If you could accurately report to the nearest degree you were doing well – where do they get 3 decimal places ??? You need 3 to report 2. Haven’t had time to read previous comments yet, but let me see. Per NASA: “There is a 50% chance that El Niño conditions will develop during the second half of 2012.” Think about that statement for just a moment. I will flip a coin and my odds of being correct are about the same 50% of being correct. Does someone get paid by the published word? If not, stop looking like an idiot. Of course, you’ll have to brave the elements over there. We know he won’t come here to face you. They only post where THEY control the moderation. Interesting how people get so heated over a truly bad forecast. Let’s face it, a “50 percent probability” is no better than a flip of a coin: El Nino will or won’t occur with equal odds. And Joe Romm “issues a rapid alert” for 2013 based on this? This is a great example of faith-based rather than science-based climate prediction. Of course Romm and his ilk refuse to acknowledge the factual data that also includes before this started, the leveling of temps for 15 years previous. All this reminds me of the movie “Twister”. Sure, it was Hollywood but we had a group of smart people operating on a shoestring trying to gather data so they could, hopefully, give people more advanced warning of a tornado. Simple, honest, worthwhile goal to help people. There are lots of smart people with lots of money behind them out to help “The Team” instead of the people. What a waste. We won’t know what will happen with the Nino 3.4 index until about 3-4 weeks after the Summer Solstice (about the 2nd week of July). My guess, which is no better than anyone elses, is for a very mild La Nina until very early next year. Joe D’Aleo pointed out elsewhere that the AMO was cold, back when the La Nina became El Nino and the mild winter of 1975-76 was followed by the bitter cold winter of 1976-77 (in the northeast USA.) Now the AMO is still warm. Hopefully this warm AMO will lessen the chance next winter will be bitterly cold, here in New Hampshire. However I’m going cut extra firewood all the same. The El Nino forecast is really based on the equatorial upper ocean temperature anomaly which has risen to about +0.5C. At the equator, the 150 metre deep ocean tends to circulate from West to East and in the Pacific, it is forced to the surface at the Galapagos Islands which can then become an El Nino or a La Nina. Its above normal now so should point to an El Nino. This is the measure over the past year. This measure tends to lead the Nino 3.4 Index by about 1 to 2 months, so in the next month, Nino 3.4 should rise to about +0.5C. [It was +0.289C last week]. But while the equator is warm in the Pacific’s depths, there is still a lot of cool water at 5S-20S and 5N-20N that is left over from the last few La Ninas and this will tend to moderate any rise in SSTs at the equator from equatorial upper 300 metre ocean temperatures. And the Pacific Trade Winds are not providing any acceleration toward El Nino right now. They are a little higher than average right now while they need to slow down considerably and even blow backwards to produce a large El Nino. While the Trades are above average, the actual surface currents in the equatorial Pacific are much slower than normal and are moving backwards across most the equatorial Pacific. Water Vapour versus the ENSO since 1948. Pretty average last month. The importance of this correlation is vastly under-estimated in the global warming debate. I’m predicting a minor El Nino of around +1.0C by December. <iI’ve been watching the little video of the Pacific temperatures on the ENSO page and it looked like an El Niño was building until recently. Now, it looks like cooler waters are moving in. If this continues I think we may be in for another La Niña. I’ve been watching the same video, there is indeed a suggestion of a small increase in Peruvian coast upwelling. Does this go beyond normal seasonal currents and represent actual upwelling? It looked similar in 2011 and then it did lead to a La Nina equatorial cool tongue. Time will tell which way it will go this time – I would bet on La nina again. I still can’t believe the precision quoted in the temperature records. I used to know the record takers for many local government authorities in Queensland during the 80′s and 90′s. Yes that is one of the obvious lies from “the Team” the new digital pyrometers and Roy’s satellite data might give you 3 decimals but the stuff recorded before 1970? NO WAY. Stronger trades should drive the Bjerknes feedback in the direction of upwelling and La Nina, not el Nino, surely? So it does look like a mixed picture. Maybe neutrality will emerge the winner. “Water Vapour versus the ENSO since 1948. […] The importance of this correlation is vastly under-estimated in the global warming debate. Bill, can you help me identify the data used to produce the top panel of figure 15 (annual oscillation of the inverted barometer (IB) effect in the NCEP system) on p.26 here [ http://ebooks.gfz-potsdam.de/pubman/item/escidoc:8469:2/component/escidoc:8468/9810.pdf ]? I have determined that the 1940s & 1970s geomagnetic & climate shifts coincide with changes in the spatiotemporal structure of the heliospheric current sheet (HCS). For hard-core chaos-believers, be aware that this dovetails perfectly with the Tsonis conceptual framework. The implications are nontrivial. More details at a later date. I am a fair gentleman. Joe Romm has given us a prediction. If it holds up we should consider listening more to him. Should it, however, fail we may consider him untrustworthy. Three years will do to see what his word is worth. Re: The WUWT ENSO meter – at zero, or neutral at the moment. Based on a sample size of one, the BoM data is updated Tuesday at 0015 (EDT, I think, Firefox isn’t telling me), so I’m going to try fetching it Tuesday at 0700 EDT and see how it goes. I think you can find it at the Special Bureau for the Atmosphere. As I posted earlier , I tend to agree with you that if an El Nino does occur, it will be a weak or minor one . Looking back at the El Nino records , it would appear that during warming periods[ last three decades] there were about 2 climate altering strong El Nino’s per decade . During cooler periods 1880-1910 and again 1940-1970] there was only one per decade . So as we head into the next three decades and if the solar predictions of lower activity are correct , I anticpate the number of strong El Nino’s to start to go down. Weak and moderate El Nino’s happpen regardless of the period.